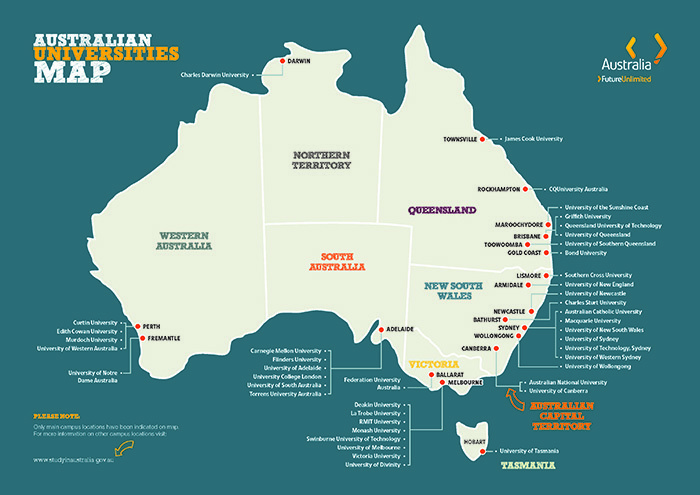 According to Study In Australia, there are 43 universities in Australia with at least one university main campus based in each state or territory. The Australian Universities map (from Study In Australia) allows you to quickly locate each university’s main campus in each state. Most universities have more than one campus and are located across multiple locations, providing students with a choice of where in Australia you would like to study. Each university is listed below according to the location (state) of their primary campus (some universities may operate in more than one state).